You may have been asked by your friend to explore TCM (“Traditional Chinese Medicine”) treatment for your child and wonder if it is viable. I wondered the same and read whatever I could online on it. The information is sparse and prescriptions seem to differ based on the TCM doctor’s interpretation of your child’s condition after examining his skin, tongue, pulse and asking questions about his urine, stools, behavioural and sleep patterns. There is therefore no standard prescription and as a result, there is much less research on the effect of the treatment. Below are whatever I understood based on reading online. The treatment is based on that the skin is affected by the ‘inside’ of the body and thus, herbs or acupuncture may be used to treat your child’s kidney, spleen or liver. The treatment is usually to remove toxins, phlegm, dampness and ‘heat’ in blood. Acupuncture for kids may use the Japanese system sho-ni-shin which does not involve puncturing the skin. Herbs, of up to 15 types, may be prescribed for you to boil and give your child. Cold compress using herbs, oatmeal bath, moisturizing herbal lotion may be prescribed too. Read more about TCM and eczema in this interview with TCM practitioner. There appears to be many similarities such as moisturizing, soaking in bath oil and control of allergic food. Diet control seems to be prescribed without conducting a skin prick test, and generally food such as cow’s milk, sugar, addictive, food colors and preservatives are to be avoided. I came across an article that suggested not having the child vaccinated as vaccination has toxin (I think vaccination is important and unless supported by strong medical evidence, we should not be excluding vaccination for our child). I always think it is safer to consume something when the side effects are known then to consume something with no known side effects (since no one tested it)! The herbs that TCM prescribe may be anti-inflammatory, antihistaminic or immunosuppressant. The improved results may not take place at all or from 2 weeks to 8 months from what I’ve read on other parents’ forum posts or blog or research. The biggest question obviously is we know oral steroid works very fast but we know it is not for long-term use (in fact, my baby Marcie’s doctor said strictly once for Marcie), is it possible then for a TCM medicine to work equally fast and yet so safe that no side effect is known? 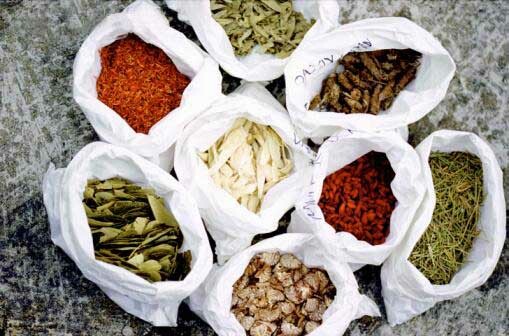 So far, there are people online that sent their TCM medicine for lab analysis and found to contain steroids (equally, you will find others saying TCM doesn’t contain steroid), people who stopped the TCM medicine and the rashes came back or others who continue with steroid application while undergoing TCM treatment. As mentioned earlier, the research is too little on TCM and for children, I personally won’t risk it, unless I have access to a lab and can test everything the TCM doctor gives my baby. Is Eczema affecting your Child’s Sleep? Understand from Prof Hugo Van Bever at sneezywheezy.com’s play group on Aug 24th that there was a UK study some time ago that found that TCM contained steroids. So far, to his knowledge, there is no study on the effectiveness of TCM.